Is Ivanka Trump’s Brand Branching Out Into Lingerie and Athleisure?All three trademark requests have been granted since the election. Treasury Secretary Sells Stake in Production Company That Made Entourage MovieFounded with an Australian billionaire and Brett Ratner, the company was also behind Wonder Woman and Suicide Squad. 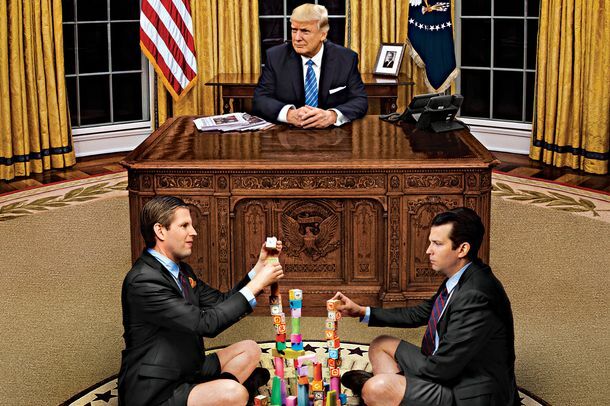 D.C. and Maryland to Sue Trump for Accepting Payments From Foreign GovernmentsTheir attorneys general will argue that the president has violated the Constitution’s emoluments clause. Trump Can Accept Payments From Foreign Governments, Justice Department ArguesThe Trump administration is trying to quash a lawsuit that accuses the president of violating the U.S. Constitution. Ivanka Trump’s Company Filed for Even More Chinese TrademarksThe filings came a day before she was named a White House adviser. Pro-Trumpcare Republicans Owned $23 Million in Health-Care StockWhen the House GOP voted to repeal Obamacare, many were also voting to advance the interests of pharmaceutical companies they owned shares of. Trump Adviser Makes $60 Million by Advising Trump to Deregulate His CompanyTrump made Carl Icahn his “special regulatory adviser” — and let him advise the government to relax renewable fuel standards on his company. Steven Mnuchin: I Wasn’t Endorsing Lego Batman When I Endorsed Lego BatmanAfter ethics complaints, the Treasury secretary is walking back his suggestion that people go see the movie he produced. Chinese Firm With Government Ties Pulls Out of Deal With Kushner FamilyThe ‘sweetheart’ deal is dead. Federal Agency Says President Trump’s D.C. Hotel in ‘Full Compliance’ With LeaseEthics experts will not be pleased with this decision. Chinese Firm With Government Ties Gives Kushner Family ‘Sweetheart Deal’Critics are worried that the company is trying to influence U.S. policy with the massive investment. Jared Kushner to Be Named Senior White House AdviserAnti-nepotism laws, be damned. Trump Shouts Out Dubai Business Partner in New Year’s Eve SpeechThe billionaire developer said he looks forward to striking new deals with Trump. Dems: GSA Says Trump Will Need to Fully Divest From His D.C. HotelBut the GSA says it has not yet settled on a position in the matter. Federal Ethics Agency Trolls Trump Over Business ConflictsThe Office of Government Ethics praised the president-elect for divesting from his business, which Trump isn’t doing. 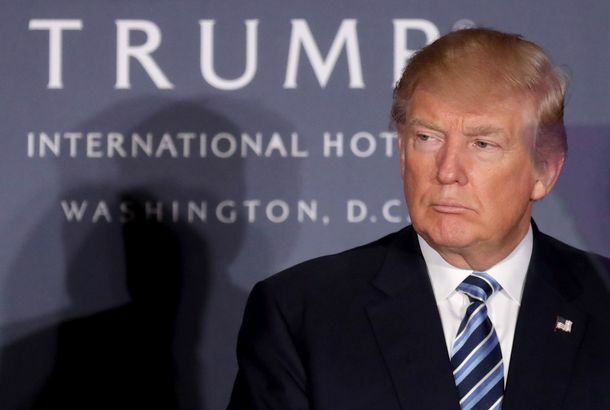 Trump Won the Presidency, Then Approval on a Tax Subsidy for His HotelAfter the election, the federal government approved the second phase of Trump’s application for a massive tax break on his D.C. hotel. Trump Says He Will ‘Leave His Business.’ That Probably Means Nothing.Trump says the move will eliminate all conflicts of interest. But if he’s still planning to transfer control of the company to his kids, he is lying. 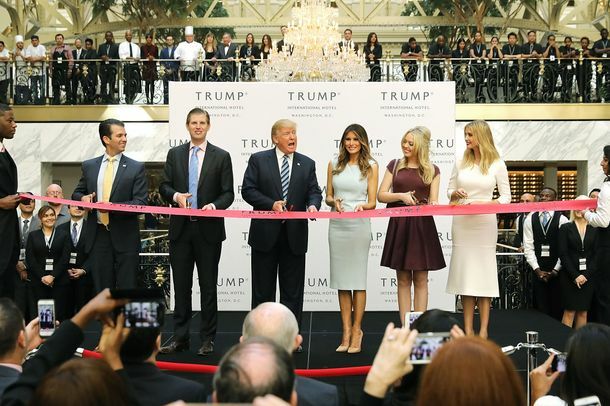 Foreign Diplomats Are Apparently Lining Up to Do Business at Trump’s D.C. HotelThe conflict of interest between Trump’s presidency and his businesses is no longer hypothetical. If Clinton Needs to Close Her Foundation, Trump Needs to Dissolve His CompanyTrump’s company has financial ties with a long list of our government’s allies and enemies. Those conflicts of interest can’t be escaped. 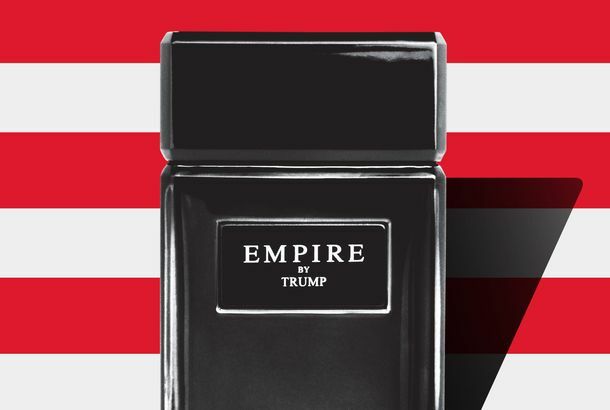 My Fellow Americans, the State of Trump Steaks Is StrongTrump’s bizarre, product-placement-filled victory speech was a reminder of the myriad conflicts of interest he’d confront as president.